The new Ford B-MAX Hatchback is a compact MPV that’s cleverly put together. It’s based on the Fiesta but can offer more space and a boxier, more practical body. Central to its appeal are sliding doors that make for easy access. As well as that, the car boasts a smooth ride and sharp handling, which means its ideal for families who need versatility and who crave a good driving experience. OSV takes a closer look at what it’s all about with our 2018 Ford B-MAX Hatchback review. Read more about the rich and colourful history of Ford and how it became one of the best-known car manufacturers in the world here. It might be a bit bigger than the Fiesta, but sharing its platform with its sibling means that the B-MAX is one of the most entertaining cars to drive in this sector. Its nicely weighted steering is direct, its body control is excellent and there’s plenty of grip on offer. Meanwhile, a torque vectoring system sends power to whichever front has the most grip, and this enhances its handling adroitness even more. As a bonus, the car is just as comfortable as it is composed. It smooths out lumps and bumps well, and thanks to its fairly small size, responsive brakes and light controls, it’s a piece of cake to drive in the towns and cities. In terms of its engines, the 1.0-litre EcoBoost petrol unit is the liveliest on offer. It’s an award-winning engine that comes with three cylinders, and it’s available with either 99bhp or 123bhp. The former can complete the 0-62 dash in 13.2 seconds, while the latter can do it in 11.2 seconds. Alternatively, if your budget only extends as far as the entry-level model you’d have to settle for the 1.4-litre petrol engine that develops 89bhp. This is an old engine with a modest power output that’s hard to recommend. A bigger 1.6-litre petrol engine that develops 104bhp, meanwhile, is the only engine that can be specified with the brands 6-speed PowerShift dual-clutch transmission. It’s a fairly expensive engine, though, and we only recommend it if you must have an automatic gearbox. Our top picks are the EcoBoost engines. The most powerful one comes with fuel-saving stop-start tech, and their distinctive three-cylinder trill gives the B-MAX a bit of character. 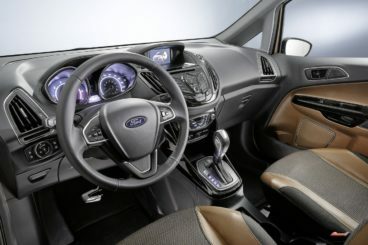 Perhaps the most disappointing thing about the B-MAX’s cabin is that its dashboard is just so cluttered. It’s hard to know what Ford was thinking when they added a slew of buttons to the central display and centre console. If you’ve stepped inside a recent Ford Fiesta, you’ll know what we mean. Overall, though, build quality is good and there isn’t too much to complain about. Sat-nav is optional for the entry level models but its 4.2” screen is a bit on the tiny side. Ford offer their SYNC voice activation system with all models and it means you get to keep your hands on the wheel – as opposed to fumbling around with all those buttons. It’s a pity that insulation isn’t better. On the motorway, all models that are paired up with the 5-speed manual ‘box will really struggle with engine noise and it can become a real pain. Is the Ford B-MAX Diesel Hatchback practical? This is what the B-MAX was intended for and the sliding doors are a major plus. In many ways, it’s just a bigger Ford Fiesta – which is, of course, no bad thing at all. Five adults can sit in relative comfort, although three adults will feel a bit cramped on longer journeys in the rear seats. The elevated driving position means visibility and access is good, while headroom is excellent thanks to the car’s tall body. Overall storage space is good, while the boot measures 318-litres. That puts it at the smaller end of the scale in this sector, although it does extend to 1,386-litres when you fold the rear seats. Is Ford reliable? Read our detailed and honest assessment here. The new B-MAX costs more than last time, but there’s now more standard kit to reflect this price increase. That said, this only really applies to models above the entry-level Studio trim, which is sparsely kitted out, to say the least. The Zetec model adds air conditioning, front fog lights, LED daytime running lights, 15” alloys and the brand’s MyKey system. The Titanium model comes with cruise control, climate control, a starter button, heated seats, automatic lights and wipers and 16” alloys. The Titanium X model rounds things off with 17” alloys, heated front seats that come partly in leather, a panoramic sunroof and keyless entry. Safety-wise? 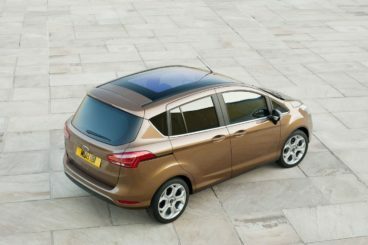 The B-MAX was awarded 5/5 when it was crash tested by Euro NCAP, scoring especially well for adult and child occupant protection. Its standard kit includes emergency braking, hill-start assistance, electronic stability control and six airbags, but it’s a shame that the Active City Stop safety pack costs a further £200. We’re sure Ford could have just slipped it in as standard. Prices for the new car start out from £13,085. For more information on our leasing deals, you can check out our page here. In terms of its running costs, the 1.0-litre EcoBoost engine is one of the cheapest models you can buy in this market – and it can boast some stellar running costs, too. Stick to the smaller 99bhp model and you can return almost 58mpg economy while emitting 114g/km of CO2. The bigger 123bhp variant is hardly much more expensive to run and can return 55.4mpg while emitting 119g/km. An older 1.4-litre 89bhp petrol engine, meanwhile, scrapes just over 46.9mpg and emits almost 140g/km of CO2. It costs £130 a year to tax, while both EcoBoost variants will set you back £140 yearly. Those sliding rear doors make it so easy to climb in and out of this car. It’s not a huge car by any stretch of its imagination, but Ford have used its dimensions well. It just doesn’t need to be so fiddly. Let’s see how the car fares against its rivals in the comparison section of our 2018 Ford B-MAX Hatchback review. 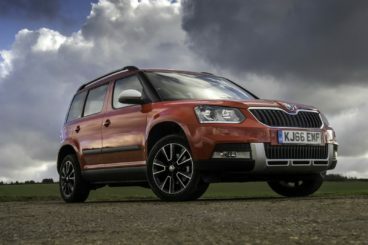 The new Skoda Yeti is practical, affordable and even good to drive. It’s a very accomplished all-rounder. Despite being larger than your typical Hatchback, the way the Yeti drives is rather car-like. It’s good to drive – and it’s even a bit fun to drive. Precise steering and a smooth gearbox are the order of the day, and despite its rugged looks, the Yeti feels right at home in the towns and cities. Four-wheel-drive is available with the bigger engines, and it allows you to rough it on harsher surfaces. In terms of its engines, a 1.2-litre TSI petrol that develops 108bhp sits at the bottom of the range – and it’s the only petrol engine on offer now that Skoda have ditched the 1.8-litre turbo unit. 108bhp is a modest power output, but it’s a cracking little engine that’s one of the most popular. Push it hard and it makes a fair amount of noise, but it makes for a decent cruiser. If the car is fully loaded its lack of torque is noticeable but other than that it’s easy to see why it sells so well. A 6-speed manual transmission is standard, but you can specify a DSG twin-clutch automatic if you wish. Running costs? The sole petrol engine emits 128g/km of CO2 and returns 51mpg economy at best, which is about average for a car of this type. Inside, comfortable seats are offset a tad by a firm ride, but there’s so much space in here that it’s a great place to spend your time on the road. Build quality is excellent, the materials used look durable, and the dashboard is easy to use. All the controls are well located and there aren’t too many buttons to get confused by. Standard kit is good too, with all models getting an infotainment system, remote central locking and Bluetooth. Is the Skoda Yeti practical? This is what the car does best. As mentioned, there’s plenty of space for all thanks to its wide dimensions, while a smart Varioflex rear seating system is a highlight. You can fold each rear seat individually for more luggage or knee room. The high driving position combines with the large windows for excellent visibility, while storage space is good. The boot, meanwhile, measures 416-litres. The new Citroen C3 Picasso is a family car that’s easy to drive, practical and roomy. On the whole, the Citroen is a comfortable car to get around in, thanks to its soft suspension setup. However, body lean is a bit of an issue at times and the car can feel a bit floaty in bends. Visibility is very good, while power steering makes life easy for you in urban settings. Out on the motorway, the car holds up well, but its tall sides mean you’ll notice the impact of strong crosswinds. In terms of its engines, this kind of car is better suited to diesel engines but for the purpose of this review, we’re focusing on the sole petrol engine. It’s a small 1.2-litre unit that has more performance than you might expect. 0-62 is dispensed within 11.8 seconds and the engine is smooth, quiet and lively. If you’ll be spending a lot of your time in the towns and cities, it’s easy to recommend. Running costs? The petrol engine can return a reasonable 56.5mpg. That’s a long way off what the diesel can manage, but if you’re a low mileage driver, those figures should be bearable. Meanwhile, the C3 Picasso costs £140 a year to tax. Inside, comfort is good, as is insulation. Even at speed, the car isn’t noisy and has a bit of a big car feel to it. A height adjustable driver’s seat makes it easy for you to find the right position, while a height and reach adjustable steering wheel is a bonus. Design-wise, the dashboard will be too dated for many of you. And while its controls are conveniently laid out on a single panel, some of the buttons are too fiddly. 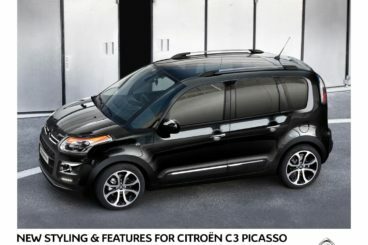 Is the Citroen C3 Picasso practical? It’s awash with interior space, despite the fact that it measures just 4 metres. Power steering and those compact dimensions make it easy to park, thin windscreen pillars enhance visibility, and rear parking sensors come as standard. The car could do with more storage spaces, but the boot measures 385-litres, which is very respectable. The B-MAX belongs to the same family as the C-MAX and the S-MAX. All are family favourites because they’re all practical, spacious and fun to drive. It’s a formula that’s going to make this one popular once again. It’s smaller than both the C and S-MAX but that will suit buyers who want a more compact car. If all this sounds good, the new Ford B-MAX Hatchback really is a family car that’s hard to ignore.